A few weeks ago, I stumbled upon a Kickstarter fundraising page for a documentary on the iconic writer Joan Didion, titled “We Tell Ourselves Stories in Order to Live”. Griffin Dunne, the nephew of Joan’s late husband and therefore her nephew as well, is working with a team to bring this film to light. The day it started, they had an $80,000 goal within a 29 day period. By the end of day one, the collected funds reached over $100,000. Today, with fourteen days to go, they’ve exceeded their magic number in spades, as the total is now over $204,000. It’s obvious to Dunne, I’m sure, and to admirers of Didion – this film will undoubtedly get made. This is good news. Didion is one of the most thought provoking writers of the 20th and 21st centuries. Her writing has inspired many. Most writers, owe her a deep degree of gratitude. 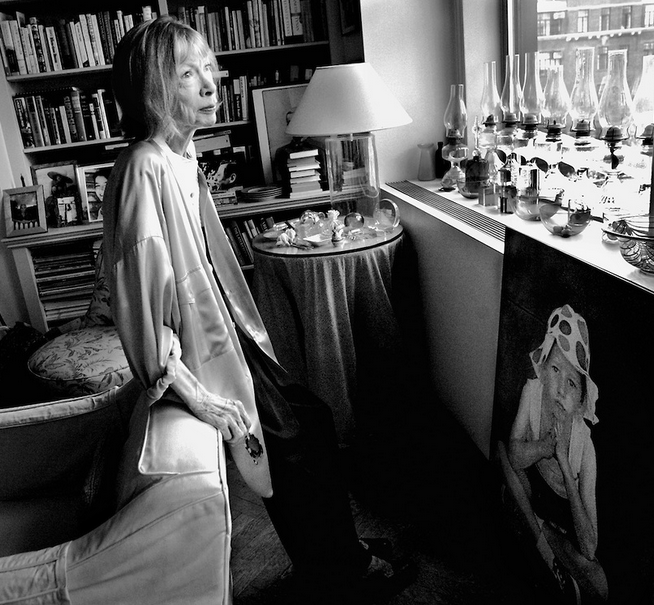 The magic of Joan Didion’s work came to me later in life. Many readings and random selections from “Slouching Toward Bethlehem” had been on my brain, but never resonated with me as it did for others. Perhaps it’s because I’m not of the same generation, nor am I from California. Nevertheless, her prose and intelligent overview of social mores within the turn of a cultural revolution was fascinating to me. Despite not being “in love” with Didion’s work – I thought of her as special – heady – hip, in a retro way. It wasn’t until a reading of Didion’s staggeringly emotional “The Year of Magical Thinking” when my mind set changed instantly. Although my own personal crisis wasn’t to come for a few years yet, I empathized with the sudden death of her husband, and shuttered over the horrendous illness that befell her daughter Quintana – who sadly passed away after the book was published. The indelible message of how life changes in an instant was stark: Not too long after reading this remarkable work, my father had a stroke. Suddenly, Didion’s words had meaning beyond measure. It’s true. One moment, and life as you know it – is never the same. I’ve read the book again after both my parents passed away. Instead of the simple empathy from my first reading, this time I lived each sentence and moment with her – this time I was standing in her shoes, as someone in mourning, someone who had been through the ringer with the medical world, someone – unlike Ms. Didion – was NOT a “cool cucumber” when the avalanche came down, and an ER doctor took me aside to say both parents would not be coming home. It’s hard going back to your house – alone – with this news, with things to do, lawyers to retain, and memories to disperse. When I decided to move to California a few years ago, I began reading Joan on a weekly basis, hoping to slip into her shoes to understand the geography and social outlook on this new state I was to call home for a while. In fact, her famous essay, “Goodbye to All That”, a story about her leaving New York, was a comforting piece, allowing the guilt I felt over leaving my home town for the warmth of the west coast to abate. One story here and there, including the work in “Slouching” fulfilled my Didion-esque view of my surroundings. A new landscape of valleys and mountain, earthquakes and dry spells laid before me as I mined the social aspect of this town. It isn’t all Kardashian and plastic actor wanna-be’s. There’s history and a tired chic to Los Angeles’ underground world of artists, comedians, musicians, neighbors, shop owners, and various historical landmarks. Reading Didion’s written work is like holding onto a bible of California’s cultural revolution that still resonates today. It’s lovely to turn to her while navigating this land. Through the bright sun that glares every day in Southern California, I read Joan’s essays through her famous sunglasses, seeking out the soul of this state – not only of its past and present – but of its future. Categories: Friday's End of Week Musing | Tags: California, Joan Didion | Permalink.